British possession, south of Spain. Jews appear to have settled there shortly after the British took possession of the fortress in 1704, and the synagogue Etz Ḥayyim in Market Lane was founded in 1760, while that in Engineer Lane, entitled "Shaar ha-Shamayim" after the similar institutions in Amsterdam and London, was dedicated in 1768. A third synagogue, Nefuzot Yehuda, was founded in 1790, and a fourth, the Bet Joseph synagogue, in 1890. Gibraltar formed a city of refuge for the Maranos of the Peninsula; even as early as 1473 a proposal was made to hand it over to them (Grätz, "Gesch." vii. 236). Thus Moses de Paz took ship there in 1777 on his way to England (Picciotto, "Sketches of Anglo-Jewish History," p. 179). A community grew up there which contributed considerably to the growth of trade between Gibraltar and Morocco and between Gibraltar and England. At times Jews of Gibraltar venturing on Spanish soil were seized by the Inquisition and forced to "recant" (see Jacobs' "Sources of Spanish-Jewish History," No. 97). After the famous siege of 1779-83 the community still further increased, and the third synagogue was built in Bombhouse Lane. In the early part of the nineteenth century the Jews of Gibraltar had often to ransom coreligionists who had fallen into the power of the Dey of Algiers. In 1878 there were 1,533 Jewish inhabitants in Gibraltar. More recently they have afforded shelter to many Russian and Rumanian Jews, and the total Jewish population of the neighborhood has been set down at as much as 9,400, of which 7,000 are native Sephardim and 2,40O Ashkenazic immigrants. The town proper shelters only about 3,000. The affairs of the community, which maintains 6 ḥebras, 2 day-schools, and 1 night-school with an attendance of 177 pupils, are administered by a managing board of five members with a chief rabbi at its head. The members enjoy a certain prosperity, the Sephardim forming a majority in the town council. The best-known families of Gibraltar are the Benoliels, Elmalehs, and Abudarhams. See also Don Aaron Cardoza. Joseph Elmaleh was the author of two works on ritual slaughter, one of which, "Dat Yehudit," was translated into Spanish. 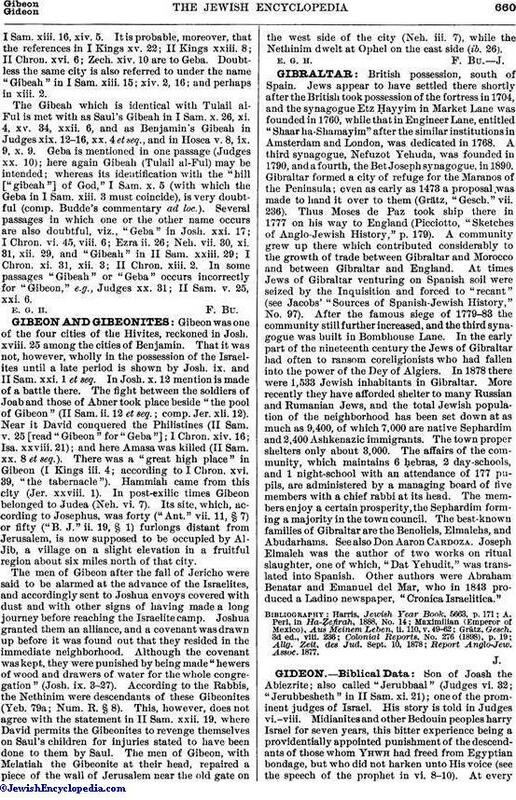 Other authors were Abraham Benatar and Emanuel del Mar, who in 1843 produced a Ladino newspaper, "Cronica Israelitica."